There are probably as many ideas about leadership as there are leaders. Leadership is a subject that has been explored and documented by academia and practitioners alike. Numerous models have emerged and are taught at colleges and organizations across the world. Most aim at identifying the actions of good leaders so that new ones can replicate them. Leadership is viewed as a necessary commodity across every organization. Without it, we feel our organizations could not be successful. In our culture, the hero and the leader are very closely tied. Our leaders—the ones we want to emulate—have accomplished great feats often times undergoing significant personal sacrifice. For the most part, this hero-leader relationship yields the leader image to be one of a male—a warrior. Someone with a strong personality—a visionary with charisma, and yes, one with a few flaws that we are willing to overlook. This image of the hero-leader limits the many other possibilities in which leadership can take place. Let’s look at leadership from the perspective of leader, leading, and leadership. In our Integral Leadership course at Saybrook this term, our instructor, Dr. Russ Volckmann, tells us that a leader is “a role in a system.” This role is composed of a set of expectations by the organization containing the “desired and appropriate behaviors and qualities of individuals who temporarily occupy the role.” Under this definition, no one could possibly be a leader 24 hours a day, seven days a week. Leading involves the set of activities performed by the leaders occupying the temporary role. Dr. Volckmann posits that literature about leadership focuses for the most part on these activities. Visioning is an example of a “leading” activity that we expect our leaders to perform. On the other hand, leadership involves the leader in a temporary role—this person’s worldviews, beliefs, and behaviors—and very importantly, the context in how it is manifested. I recently heard an interview on the radio of five men who saved the life of a motorcyclist who was stuck underneath a car due to an accident. This accident happened outside an office building. The five men in the interview promptly came out of the building and, with minimal communication, applied Herculean force to turn over the car and liberate the motorcyclist from the rubble. One of them called 9-1-1 while the others tended to the injured. In the interview, the reporter asked what made them do this. None of them could really explain how they even got out of the building much less how the rescue mission got started and who was in charge. However, they could all express their satisfaction in saving a life—the life of someone whom they did not know but hoped to meet once he was discharged from the hospital. The reporter called the rescuers “American Heroes.” They did not feel that the title was warranted but chose not to argue with the reporter. Here is an example of leadership in the moment. The five men stepped into the leader role in the context of saving someone’s life. Their worldviews reflected in their actions were clear: They were all willing to do something to save someone whom they did not know. These leaders had no other thought than to be of service to the injured motorcyclist at that moment. None of them thought they did anything extraordinary. When we look at context as a critical component of leadership, we realize that we cannot in an absolute sense define leaders and leading activities. As in the example of the motorcyclist rescue, we do not know if the five individuals in their work context would qualify as leaders or if they even have what we would traditionally associate with leader roles. Regardless, a person’s life was saved because of leadership actions. Author Donna Ladkin in Rethinking Leadership defines the leadership “moment.” This moment is the actual experience of leadership founded on four forces that act in equilibrium. The first is the leader in the temporary role fulfilling the expectations set by those that defined the role. The second force—in balance with the first—is that of the follower. This is also a temporary role with a different set of expectations. The relationship between leaders and followers constitutes the human force necessary for something to happen. In the example, all five men were leaders and followers of each other. They had to coordinate their efforts to turn over the car. The other two forces needed for the leadership “moment,” according to Ladkin, are the context and purpose. These two forces also need to be in balance. In the example, the context was the car-motorcycle accident and the purpose was to save a man’s life. The purpose had to be important enough for the five men to apply enough force to move the car. Oftentimes we expect our leaders to do extraordinary things, but do not understand that the purpose and the context may not be clear. By using Ladkin’s leadership “moment,” we can embrace a more relativistic—and I would say realistic—definition of leadership. Instead of spending all of our energy in learning leading behaviors so that we can teach them to ourselves and others, we can focus on learning the balance of the leader-follower relationship and the clarity of context and purpose. I personally believe that leadership is an emergent quality within humans and available to all. The understanding of this quality starts with the notion that being a leader—just as much as being a follower—is a temporary role. All roles have expected behaviors. Rather than assuming that the expected behaviors should blindly follow those defined in textbooks, we should design our expectations for these roles to be what works best for our organizations. The leader-follower behaviors needed in a coal mine are very different than those needed in a hospital. 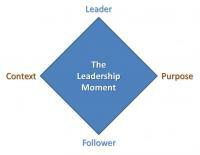 As stated, context and purpose go together and are absolutely essential to experiencing the leadership moment. I recently participated in a team building exercise—it was a cooking competition between three teams following the Iron Chef format. The team members were all managers and executives; we could say that all have work-related leader roles. However, in the context of the competition, we needed one leader and many followers. As we divided the various dishes we ended up cooking amongst our team members, we formed smaller teams with one sub-leader and several followers. In this competition, the context and purpose were clear: prepare the best-tasting and best-plated dishes using the provided secret ingredients within an hour. What we struggled with was the leader-follower relationship. I feel the winning team made its sous chef its overall leader and, consequently, ended up with the most elaborate and best tasting food. My team completely ignored our sous chef and resisted the direction of our overall leader because we did not trust that she had the right vision for winning the competition. The winning team experienced a better leadership moment. The good news is that I experienced a learning moment.